Take the meat out of the fridge half an hour before cooking. If you are using wooden or bamboo skewers, put them in cold water to soak. In a frying pan, bring about 5mm of water to the boil. Turn down the heat once it starts boiling, add the red chillies and boil for 5 minutes. Remove the chillies from the water and pat dry. Cut the flesh from the skin. Heat a splash of olive oil in a frying pan. Turn down the heat and fry off the tomato purée for 1 minute, stirring continuously. Put the salt, black pepper and garlic cloves in a mortar. Bash until you have a thick paste. Add the red chilli, the herbs and the anchovies and work into the paste. Add the tomato purée and the red wine vinegar. Thread the meat onto skewers and season with salt. Cook the meat on a hot grill for about 3 minutes in total, turning frequently, or until cooked to your liking. 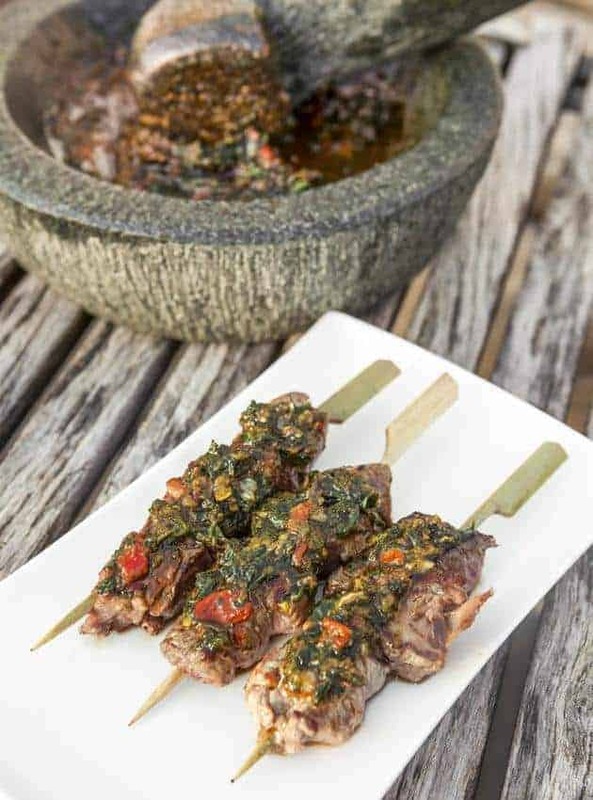 Serve the meat with the anchovies chimichurri sauce.